A tiny bit higher than last time (161), probably changes depending on mood. Anyway, this is the picture I was after. Thanks for linking a nice test like this... by the way i´ve scored very like the same you did. I´ve heard about this condition less han a week before but I'm not sure I can get medical evaluation easily in my country. I was searching for some things on google and I came across this quiz. Your neurotypical (non-autistic) score: 47 of 200. I've never had any sort of diagnosis or anything and no one has mentioned anything. Very interesting. Thank you for posting it. I got about 90 of 200 apsie, and 112 non-aspie, but I am sure I am an aspie. Hello, diagnosed by a doctor! Thanks for the link and for posting your scores. I am a Mom of two boys on the autism spectrum. The oldest (10) has an AS diagnosis and the youngest (3) has an autism / ASD diagnosis. I'm still awaiting "official" diagnosis but I know in my heart with 100% certainly that I'm an Aspie. I'm not sure how to interpret the information I'm getting. I got 119/82 on this test and a 32 on the AQ test. I've read several of your posts and I keep thinking "Hey that sounds like me" but then you'll discuss other traits of aspies and it doesn't seem to fit. I have no trouble communicating with my circle of close friends, but I'm horrible with "small talk". I feel out of place with most groups. My hands are constantly in motion (stimming?). I do have a tendency to say things that upset people. I do get caught up in my interests, which my friends are tired of hearing about. I don't know what I'd do without everyone's favorite Time Lord. Things get chaotic if I don't follow a schedule, but I wouldn't say that I "meltdown". I'm not sure how to interpret the information I'm getting. I got 119/82 on this test and a 32 on the AQ test. I've read several of your posts and a keep thinking "Hey that sounds like me" but then you'll discuss other traits of aspies and it doesn't seem to fit. I have no trouble communicating with my circle of close friends, but I'm horrible with "small talk". I feel out of place with most groups. My hands are constantly in motion (stimming?). I do have a tendency to say things that upset people and I do get caught up in my interests. I don't know what I'd do without everyone's favorite Time Lord. Things can get chaotic if I’m not following a schedule but I don’t “meltdown”. There's nothing to say that in order to have aspergers, you must display "ALL" of the symptoms. In fact, the diagnostic criteria reads like a multiple choice question.. "any three of the following behaviours", etc. I'm not even convinced that the diagnostic criteria is 100% right either. In some ways, the label of aspergers (or autism) is widening to encompass people not previously thought to be on the spectrum. What number would most NT people get on this quiz? I can't remember quite what NTs get but I think it's significantly lower probably even below the hundreds. 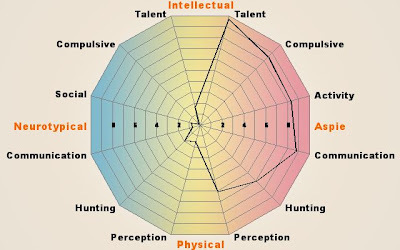 I know this was posted back in '07, but I have been reading several of your blogs regarding Aspergers. For a long time, I was convinced that I have Depression or might be bi-polar. I did tons of research on those, and though I'm still sure I have one or the other, I'm placing all my money on Aspergers. I took the quiz you linked and got 174. I have saved a PDF file. From reading your blog posts and several medical publications, I am convinced that I have this condition. I only work part-time retail (which is an extremely grinding work environment for me, but the best I could get in this economy), and I don't have insurance. So I guess until I can put a few paychecks together, I'll be living with a self-diagnosis for a while. But just having a name to go with what I thought was perhaps insanity or the like is wonderful. Thanks so much for your blog. I found you on Google searching for Aspergers! :) If you have any ideas on what kinds of places give diagnoses, please consider making a blog post about that. As a recently diagnosed Aspie, it was great to read your blog!